Use summer vegetables for this Slow Cooker Paleo Sausage and Vegetable Ratatouille and keep your kitchen cool. Click here to see The BEST Paleo Slow Cooker Recipes! Click here to see The BEST Paleo Instant Pot Recipes! Summer vegetables like peppers, eggplant, and zucchini are so flavorful when they’re fresh from the garden which explains why there are endless dishes using some combination of them. I love all those summer vegetables and I’m a huge fan of spicy Italian sausage, so everything about this Slow Cooker Paleo Sausage and Vegetable Ratatouille from Everyday Maven sounds fantastic to me. fresh basil or parsley for serving. 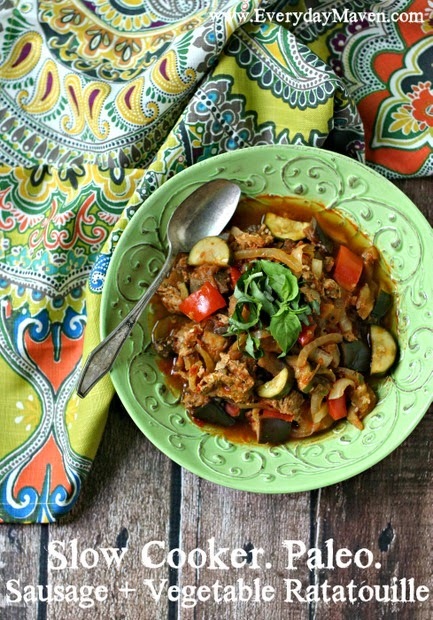 Get the Complete Recipe for Slow Cooker Paleo Sausage and Vegetable Ratatouille from Everyday Maven. Use the Index Page for Paleo to see all the slow cooker or pressure cooker Paleo recipes that have been featured on this site. Alyssa, my pleasure. It really looks so good!